One of the worst labels a dog can receive is “aggressive.” In fact, in many states, that word can be a death sentence. It is important for owners to understand the signs of canine aggression, and what to do in order to fix the problem. You can find some good books here on this as well. New pet owners may not understand that nipping, biting, and gnawing are all normal puppy and adolescent dog behaviors. While these actions can be frustrating (and painful) they are not indicative of an aggressive dog. 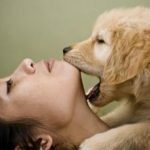 Instead, this behavior stems from the fact that dogs interact with the world via their mouths (much in the same way as toddlers), and until they are taught otherwise, they will continue to behave in a way that is most natural. Therefore, if your puppy nips at your heels, chews on your hand during play time, or bites down on your arm as a way to seek attention, realize that these are all common ways a puppy would play with a canine friend. To remedy the behavior, give your dog a sharp “no!” and cease playing with your pet immediately. When your pet loses a playmate due to inappropriate behavior, he or she will quickly put together cause and effect. Some dogs show aggression when their dominance is challenged. This can occur as a byproduct of a puppy being from a large litter, or as a genetic predisposition. The behavior can manifest as dog-on-dog aggression or dog-on-human aggression. 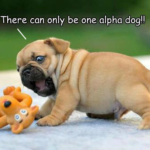 Genetically, dominance aggression is most common among smaller breeds, but can occur in any dog. Common signs of dominance aggression include barking, growling, lunging, or snapping whenever the dog does not get his or her way, or if another human or animal tries to challenge the dog. For a first time dog owner, the best way to handle dominance aggression is to work with a trained animal behavioralist, who will safely help you rehabilitate your pet. The key step is to assert your dominance in non-violent manners, such as by taking control of your pet’s resources and setting boundaries within the household. Dogs respond to fear via a fight-or-flight mechanism and those that choose fight may show aggressive tendencies towards predictable stimuli. For instance, a pet with fear aggression may single out a certain type of person or breed of dog and react negatively by barking, lunging, or growling. In this instance, your pet may have had a negative encounter with a particular person or animal in the past, causing fear of any person or animal that bears resemblance. Fear aggression may also manifest as territorial behavior, either of the dog’s household or of the owner’s space. For these dogs, fear aggression is often caused by lack of socialization. When a dog is properly socialized he or she will have developed the tools necessary to cope with unexpected or potentially “scary” situations, such as an unknown (to the dog) person being invited into the home. When not properly socialized, a dog may perceive every new situation as threatening, thus causing it to react poorly. If your pet’s fear aggression is mild, the best cure is socialization and desensitization. Introduce your pet to as many new sights, smells, experiences, people, and animals as possible in order to help it develop necessary coping mechanisms. If your pet is fearful particular types of people, animals, or objects, gradually introduce your pet to these stimuli. For instance, if your dog is fearful of men wearing hats, allow your dog to first sniff and interact with a hat. Next, introduce your dog to a man in a hat from a long distance, and praise your dog profusely when he or she behaves well. Gradually shorten the distance between your dog and the “scary” object (all the while providing praise) until the fear is diminished. In more extreme instances, the help of a professional will be required. A serious form of aggression is resource guarding. Here, dogs will snap, growl, or bark at any person or animal that approaches a “resource” such as food, toys, treats, or bedding. 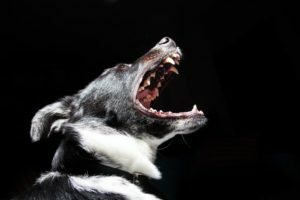 Many serious dog attacks involving a family pet have occurred due to resource guarding, such as when a child reaches toward a dog’s food bowl while the animal is eating. Dogs most commonly develop resource guarding as a result of previous neglect; living for any length of time as a stray; or from lack of boundaries within the household. There are a number of remedies for resource guarding, depending on the severity of the behavior and the guarded resource. 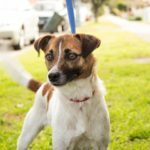 If your dog guards a shared space from another animal in the house, such as the couch, the best solution is to disallow any of your pets from accessing that area. Another important step is to make sure there are enough toys and treats for each pet in your household to avoid conflict. If necessary, restrict access to these items unless you are able to supervise your pets. Always minimize the chances for a known resource guarder to react. If your dog has food aggression, keep him or her separate from the family during meal times. For dogs that show resource aggression toward humans, professional help is recommended in order to safely rehabilitate the dog. Punishment aggression can occur when an owner uses forceful methods of correction with his or her dog, especially from an early age. Dogs learn to navigate the world around them by mimicking those in their pack that are dominant – either human or canine. In some instances, a dog may assume that forceful corrections are appropriate, and will nip or snap when a human or animal is behaving unfavorably. Additionally, an animal with punishment aggression may lash out when being physically corrected for bad behavior. If your dog primarily displays aggression during punishment, switching to a rewards-based training program is recommended.